Registration: Registration is now closed. Practical information for conference attendees is below. 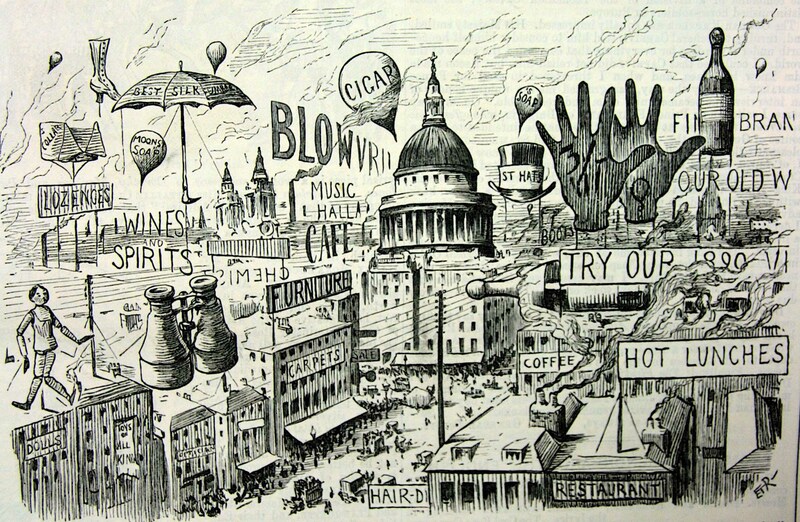 If you are unable to attend the conference, please contact the organisers at medicineandmodernity@ell.ox.ac.uk. Unfortunately, within a week of the event, refunds for cancelled places and accommodation booked at St Anne’s cannot be processed as stated in the University of Oxford Online Store terms and conditions. Conference Programme: The final conference programme is now available here, and speaker abstracts with biographical information are available here. Copies of the programme and abstracts will be included in your conference pack. A map of St Anne’s College is available here. On arrival, please go to main reception desk which is situated in the Lodge (Building F) and you will be directed to the registration area and conference rooms in the Ruth Deech Building. Accommodation: If you have booked bed and breakfast accommodation at St Anne’s, check in is from 1pm at the Lodge. Please check out by 10am on your day of departure and return your key to the Lodge. Luggage can be stored securely at the Lodge prior to check in and after check out if required. Breakfast is in the Dining Hall from 8-9am. Please contact the Lodge at any time during your stay if you require any assistance or information. The telephone number is 01865 274800, and it is staffed 24 hours a day. If you need to book a taxi for your departure, the Lodge has a list of local taxi companies and will assist you. Presentations: Please bring your presentation slides on a memory stick. All conference rooms have a laptop and projector available for use. If you wish to use your own laptop and it is a Mac, please note you will need to bring your own adaptor in order to connect to the projector. Speakers are reminded that all papers are 20 minutes in length. Access: The Ruth Deech Building has lift access to all floors. The Tsuzuki Lecture Theatre and the seminar rooms are all on the lower ground floor and are adjacent to each other. Wifi: Wifi is available throughout the Ruth Deech Building and St Anne’s College through OWL, Eduroam or The Cloud. If you are not set up for OWL or Eduroam, please select The Cloud from the list of available networks and follow the instructions to connect. Toilets: Toilets are located in the foyer area of the Ruth Deech Building, directly opposite the seminar rooms, and also in the Dining Hall building. First Aid: First aid is available at the Porters Lodge. Fire Assembly Point: The Fire Assembly point is marked FAP2 on the college map above. For those staying in college accommodation, fire procedures and a site map are on the back of each bedroom door. 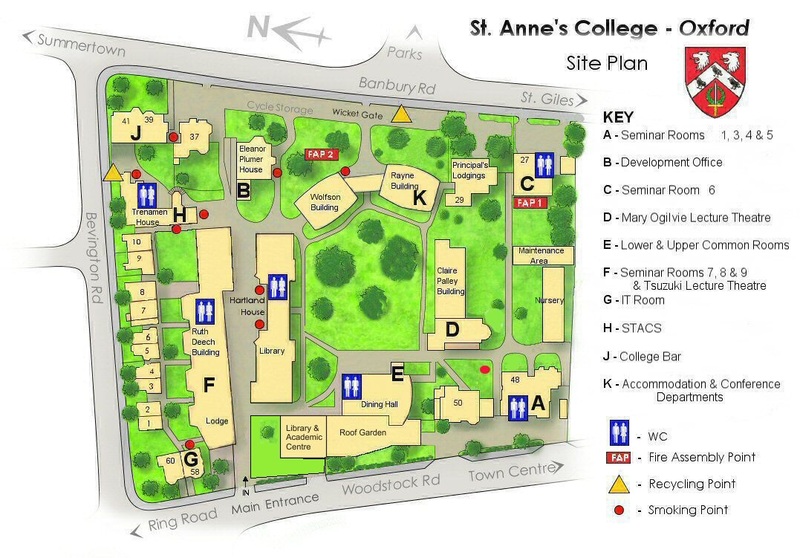 Smoking Points: St Anne’s College has designated smoking areas, which are marked by red dots on the college map here. The nearest smoking area to the conference rooms is directly opposite the entrance to the Ruth Deech Building, outside Hartland House.